We will be offering the chance to win a large Trevor the Turtle soft toy at the Kidz-to-Adultz-Middle exhibition – Abacus Healthcare’s new mascot, perfect for cuddles after bath time. Trevor the Turtle is a delightful character who loves children and is looking for a caring home. He would like to invite all parents and children attending Kidz to come and enter his free prize draw on stand D4a. For a chance to win Trevor, you simply need to register your details with the friendly product advisors on the Abacus stand – the lucky recipient will be selected at random after the show and contacted via email. Thursday 16th March 2017, 9.30am – 4.30pm, Ericsson Exhibition Hall, Ricoh Arena, Coventry CV6 6GE. Stand D4a. 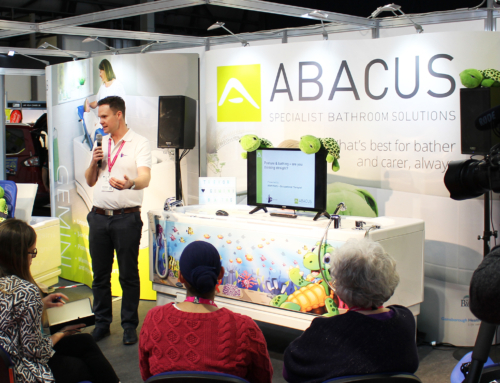 Trevor and the Abacus team look forward to seeing you at the show!